As I wrote in yesterday’s post, over the next six days I will be discussing six new-media principles, adapted from my forthcoming e-book, the New-Media Survival Guide. Today’s principle is based on the importance and power of conversation, reflecting new media’s emphasis on dialogue rather than monologue. 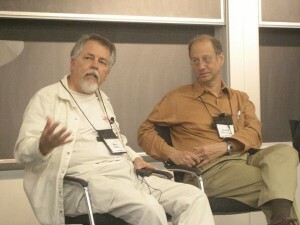 Doc Searls and David Weinberger: "Markets are conversations"
In 1999, when Doc Searls and David Weinberger wrote in The Cluetrain Manifesto that “markets are conversations,” it was a fresh, radically new idea. Today, for anyone who’s thought much about social media, it verges dangerously on being trite. But however obvious the idea may seem, it remains a powerful, foundational concept for new media. We ignore it at our peril. Searls and Weinberger were addressing their comments above all to public relations and marketing people. In the beginning of their chapter, in fact, they point to magazines as a “form of market conversation.” But the publishing industry’s advantage is only relative; it too has tended either to ignore or to dominate the conversation. Before the Internet, journalism was largely a one-way form of communication. Publishers talked to their readers, but few readers could talk back, and in only limited ways. Digital technologies have dramatically changed the balance. Now, readers can easily and immediately comment on stories by commenting on blogs. What’s more, they can now be publishers themselves, whether through their own blogs, Twitter, Facebook, or other forms of social media. Not only can they talk back to publications, but they can also compete against those publications by talking to other readers directly. As a result, the nature of journalistic discourse is transforming. It is no longer a one-way speech, but a two-way exchange. The journalist’s role is no longer to dominate or control the conversation, but to participate in the conversation, support it, and help a variety of other voices to be heard. As I say, all this is old hat for anyone even slightly familiar with new media. But that’s the challenge. We tend to forget that a conversation is not simply one person talking, then the other. For any participant in a communication, the most important elements are first, truly listening to what others say, and then meaningfully responding to them. As their use of a social-media platform like Twitter shows, even today journalists tend to think of their primary media role as talking. But true dialogue demands an equal emphasis on those other conversational skills: listening and responding. This month, besides writing these time-limited daily posts, I’ve been putting the finishing touches on an e-book to be called the New-Media Survival Guide: For Journalists and Other Print-Era Refugees. If all goes well, it will be available next month. Stay tuned. Like many posts on this blog, the e-book aims to help traditionally trained journalists, marketers, and content creators understand the ideas and values that differentiate new media from old. It doesn’t try to be the definitive word on the subject, or to offer step-by-step guidance in using new-media tools. Instead, I hope, it will provide a succinct, readable overview of the key principles driving the evolution of new media. In the introduction to the guide, I identify and explain six key principles of new media. Both as a preview and as an invitation for your feedback, over the next week I’ll review each of those principles in a blog post. For most people, the challenges in adapting to new media are not practical or technical, but attitudinal and intellectual. Once they understand the ideas behind new media, the hurdles, if not always the objections, largely vanish. And the first thing to understand about new versus old media is how much both have in common. Their shared concern is communication, and they involve many of the same concepts, methods, and values. For the rest of this week, I’ll share a few thoughts about how these preferences underlie new-media practices. Tomorrow I’ll discuss the first, dialogue over monologue. And in the spirit of dialogue, I hope you’ll share any thoughts you have on this topic in the comments section, both today and during the rest of this week.